Amatrol’s Analytical Process Control Learning System (T5554) teaches knowledge and skills essential for controlling and modifying the chemical properties of a substance, which is important to industries such as pharmaceutical companies, beverage companies, and refineries. The system allows learners to explore a wide range of topics, including analytical process control, pH electrodes, pH meters and transmitters, loop controllers, and more! 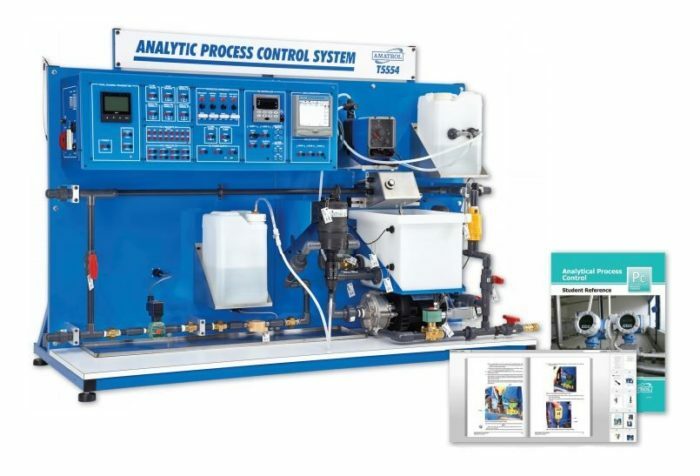 The Analytical Process Control training system includes a tabletop workstation with a control panel, PLC interface, and industrial pumps, tanks, and piping. Learners will use these components to perform hands-on skills, such as manually setting and controlling an electronic metering pump, testing the pH of a solution using pH test strips, and connecting and operating a continuous loop pH control system. These skills will prepare learners for industrial process applications they’ll encounter on the job. Amatrol’s Analytical Process Control training system features an impressive variety of real-world components, including: a PLC interface panel, metering pump, injector pump, continuous stirred tank reactor (CSTR), pH transmitter, pH probe, two reagent tanks, and a piping by-pass network. Learners will practice a variety of real-world skills, such as: manually controlling the liquid flow rate in a process; setting the injection ratio control for an educator pump; installing and connecting a combination glass electrode; calibrating a Honeywell DL421 pH sensor module; and calculating resolution in units of the measured parameter. The Analytical Process Control training system includes an in-depth, comprehensive curriculum that provides a strong foundation in analytical process control, including these major topics: process control concepts and safety; instrument tags; piping and instrumentation diagrams; pH electrodes; pH meters and transmitters; and loop controllers. The curriculum also features important hands-on skills to prepare learners for real-world situations, such as configuring a Honeywell UDC 3500 for continuous pH control. The curriculum is also available in a convenient eBook format with enhanced features like keyword searches and zoom controls that enable users to quickly locate and view information. The Analytical Process Control training system requires a PID Controller Module, offering a choice between single loop (T5554-C1-A) or dual loop (T5554-C2-A) options. Other options for expansion include: a Three-Channel Data Acquisition Learning System (T5554-R1A); an Advanced Analytical Control Module (T5554A2B); an Advanced pH Control Module (T5554A1A); and a Classic Glass Probe Module (T5554A3). A sample copy of the Analytical Process Control Student Reference Guide is also included with the system for your evaluation. Sourced from the system’s curriculum, the Student Reference Guide takes the entire series’ technical content contained in the learning objectives and combines them into one perfectly-bound book. Student Reference Guides supplement this course by providing a condensed, inexpensive reference tool that learners will find invaluable once they finish their training, making it the perfect course takeaway.